Our ears help us detect sound. While your ears pick up the sound, it is your brain that does the hard work of making sense of it all. There is much more to the ear than the part you can see on the outside of your head. The middle ear also contains the Eustachian tube which helps equalize pressure and drain mucus. Ear infections are more common in children because of their developing immune systems and differences between their Eustachian tubes and those of adults. The inner ear contains the spiral shaped hearing organ called the cochlea as well as the vestibule and semicircular canals which help with balance. Sounds waves are passed from air to liquid in the inner air. The inner air also contains tiny hair cells which react to sound waves, triggering chemicals that are sent to the brain as nerve impulses. 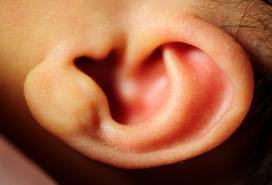 Abnormalities in the inner ear of humans can cause deafness. Skin glands in the ear canal produce ear wax which helps protect the ear by lubricating it and cleaning it of dirt and dust. Excessive ear wax can impair hearing, especially if it is pressed hard against the eardrum. Ear wax normally comes out of your ear naturally so it’s not a good idea to try and remove it yourself unless it is causing health problems (best to see your doctor first). Piercing earlobes and ornamenting them with jewellery has been common practice around the world for thousands of years for both for cultural and cosmetic reasons. In November 2012, Lasha Patraya of Georgia set a record for the strongest ears by pulling an eight-ton truck 21.5 metres with his ears. JM Barrie, author of Peter Pan, was admired for being able to wiggle his ears. Spectacles were introduced in Italy in 1268 but arms to clip them round the ears were only added in 1727 by English optician Edward Scarlett. Giraffes clean their ears with their long tongues. In 1988, a clinic in Bangkok published a claim that you can get rid of hunger by pressing lettuce seeds into your ears 10 times before meals. Asians and American Indians have dry, flaky earwax while Caucasians and Africans are more likely to have moist, brownish earwax. “We have two ears and one mouth so that we can listen twice as much as we speak.” (Epictetus, Greek philosopher around AD100). One in ten people suffers from tinnitus and though it may be caused by exposure to loud noise that is by no means always the case. Fish do not have ears, but they can hear pressure changes through ridges on their body. bones in the human body. All three together could fit together on a penny. The ear continues to hear sounds, even while you sleep. Sound travels at the speed of 1,130 feet per second, or 770 miles per hour. Dogs can hear much higher frequencies than humans. Ears not only help you hear, but also aid in balance. hearing mechanisms, which helps them hear and catch prey. hearing in only 7 1/2 minutes. Thirty-seven percent of children with only minimal hearing loss fail at least one grade. Male mosquitoes hear with thousands of tiny hairs growing on their antennae.